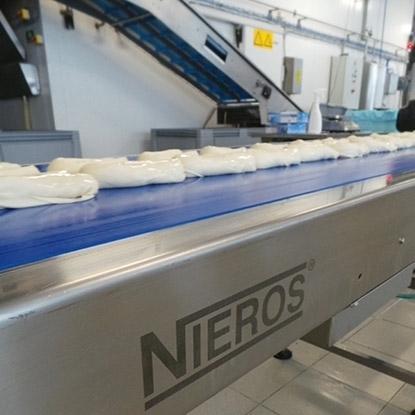 NIEROS® marination processing lines represent comprehensive solutions for quick, easy and effective red meat, poultry and fish marination—for larger or smaller pieces with or without bones—while additional in-line adjustments support the marination of other raw food materials. Specially designed for large-scale production plants, each unit is custom-built to match your precise requirements in terms of production process, type of end product and production capacity. Complying with the standards of HACCP, IFS and NSF, the production process is largely automated to protect food against deformation and add value to your products. The main conveyor belt transports red meat, poultry or fish pieces to the marinade pool. Once marinated, the meat is transported by multilevel conveyors for optimum marinating results. Due to automated in-line multilevel system, there is very little to no manual product handling, resulting in significantly less product damage during processing. After the marination, the meat is conveyed to the packaging station.